Loosen the battery terminal nuts and disconnect both battery negative and positive terminals. 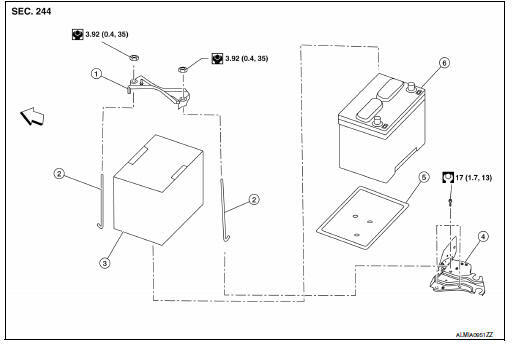 To prevent damage to the parts, disconnect the battery negative terminal first. Remove battery frame nuts, battery frame and battery rods. Remove battery cover and battery. To prevent damage to the parts, connect the battery positive terminal first. Ensure battery cables are tightly clamped to battery terminals for good contact. Check battery terminal for poor connection caused by corrosion. Remove air cleaner and air duct. Refer to em-25, "removal and installation". 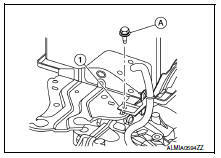 Remove CVT breather hose bracket bolt (A) and CVT breather hose bracket (1) (if equipped). Remove battery bracket bolts and battery bracket. Remove harness clip from battery bracket.